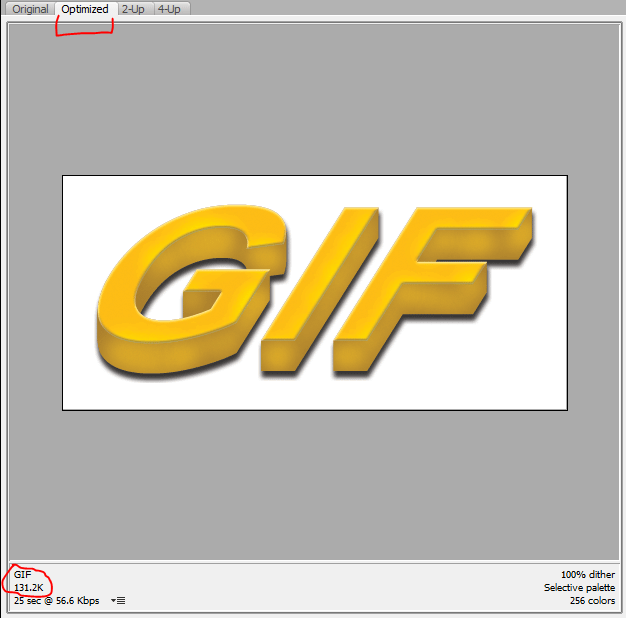 In this tutorial I will show you the basics of creating a GIF animation. I created a simple GIF for my Photoshop 3D text tutorial. So I thought it would be easy to make a short tutorial on Frame Animation in Photoshop. Let’s start with the text. I will change it to “GIF”. Then let’s go from there. Now I won’t go into the detail about the steps to create the 3D text (see the tutorial), but instead show you how I took the in-between-steps and put them into frames on the animation timeline. Now that we have the 7 images from beginning to end stage, lets open the frame animation. Window > Animation > Frame Animation. Just like below, we see a frame animation player open. The image you are working on is put into the first frame, we can reorder things in a bit. We want the first image of the 7 you seen above, in the first frame. 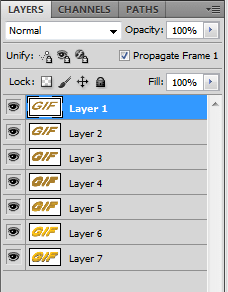 So as you are working on images, you can save each one you want as a frame in a layer. 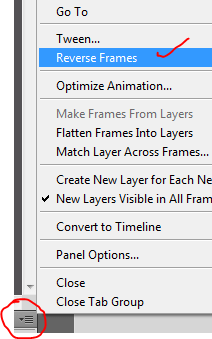 Below you see all the layers in the Layers tab. Now you can put those frame into the time-line by clicking the bottom top right button on the Frames Animation time-line (circled in red). 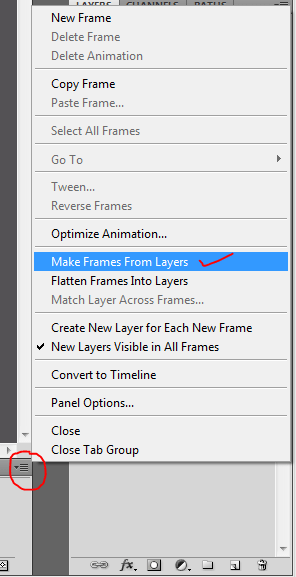 In the sub-menu choose “Make Frames From Layers“. This will copy and paste all the 7 layers into the time-line like you see below. There is one problem though, the last Layer (7) was put into Frame 1. But we can easily reverse the order. So now if you check the Frames window you will see the frames are indeed reversed and ready to be tested in an animation. We test it by clicking the Play button circled below. The only problem is that it is way too fast because we have not put any time delays in each frame. 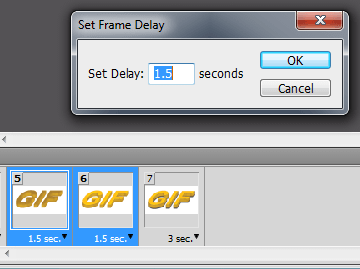 To put a time delay in all the frames at once, click the first frame and hold Shift to and then click the last frame. This will group select all the frames. 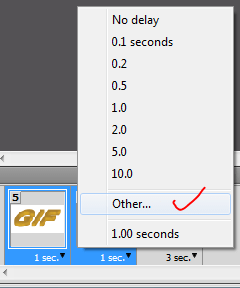 Now all you have to do is right click the “0 sec.” circled below and choose a time delay (I chose 1.0 second). All the frames now have a 1 second delay. Now you can test the animation by clicking the Play button. There is still more tweaking to do with the time delays. I will put a 1.5 sec delay on Frames 5 and 6. Do this by choosing “Other” in is list. Then for the final Frame, which is the finished 3D text image, I will put a 3 sec delay. With that, play the animation and things should look alright. It’s not a GIF file yet, so let’s go to “Save For Web & Devices” on the menu under File. The image above shows it is on “Optimized” which is 131.2k. The original is over 400k, so this is a considerable savings in file size. 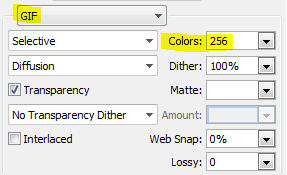 You can save more on file size if you reduce the colors to 128 or 64, but the quality if the image suffers. Still you must consider that any GIF file over 500k is big for embedding on a webpage (slows loading speed). 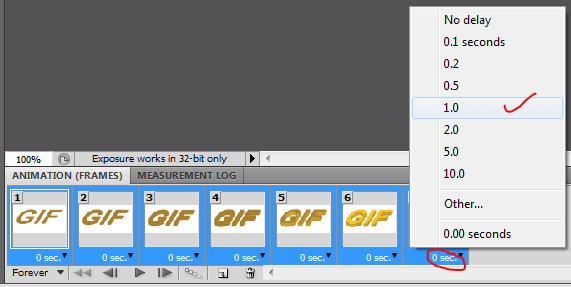 Also the embedded GIF file can take 10 to 20 seconds to start going at its normal animation speed. Go ahead and Preview or Save your file to the location you want. I hope you learned a little about Frame animation. I just touched the surface on GIF animation in Photoshop here. I did another Frames tutorial that shows some more cool stuff you can do in the creation of a GIF. See my XRay GIF tutorial. There is also a more advanced animation you can use in Photoshop 6 and up. that is Video Timeline animation. You can see the timeline text animation tutorial I made on that. Great GIF on 3d text effect. This gives me an idea about my project on a logo with a torch fire on the design to have a glowing fire effect kind of similar from this tutorial. Great write-up by the way. This is the right website for anyone who wants to find out about this topic. You realize a whole lot its almost tough to argue with you (not that I actually will need laugh out loud). You definitely put a fresh spin on a topic that’s been discussed for ages. Great stuff, just great!